The closure of the plants will lead to the loss of almost 700 jobs. The US- based Aluminium giant, Alcoa, had a notorious track record all of violating workers’ rights across the world. On November 8, thousands marched through Aviles protesting Alcoa's decision to shut down the smelting plant. Spanish workers are up in arms against US-based aluminum giant Alcoa’s proposal to close down two smelting plants, which could threaten up to 700 jobs. On November 8, tens of thousands of people marched in Aviles, protesting the decision and seeking the intervention of the government. However, the government’s response has been outrightly hostile. On November 11, Magdalena Valerio, minister of labor, migration and social security, categorically rejected the demand from the workers, stating “We are not in a state-run economy, how [do we] intervene in the company. We are not in a communist regime”. Prior to the march of November 8, one of its organizers, the Asturias committee of the Communist Party of the Peoples of Spain (PCPE), demanded the nationalization of the productive and energy sectors, expropriation of the productive plants, property and funds of Alcoa in Spain, as well as the termination of state contracts with the company. It was on October 17 that Alcoa announced the closure of their smelters in Aviles and La Coruna with a combined production of 180,000 metric tons per year. The closure will result in the loss of around 700 jobs in both the plants. The company claimed that the increase in the price of electricity, inefficient technology, high fixed costs and the overcapacity of Chinese aluminum smelting plants were the reasons for the closure. The management also said it had explained the decision to the unions of workers in Alcoa’s three plants in Spain: Aviles, La Coruna and San Ciprian (Lugo). However, the trade unions in the country opposed the move tooth and nail. Workers of both the Alcoa plants staged protests against the move on October 19. 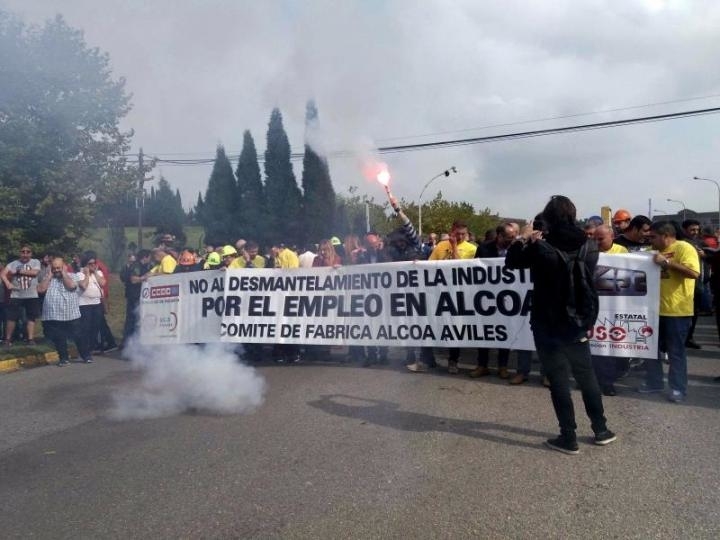 On October 27, the workers of Alcoa Avilés marched on foot for over 30 kilometers to Oviedo, demanding a solution from the government to avoid the closure of the plants. Luis Colunga, deputy general secretary of IndustriAll Europe, said “IndustriAll Europe opposes the closures and supports Spanish trade unions and the Spanish government in finding an urgent solution. Alcoa has a responsibility to look at the future of the plants. It cannot simply close these plants”. Communist Party of the Peoples of Spain (PCPE) also expressed solidarity with the workers. Demanding the immediate nationalization of strategic sectors, the PCPE said these cannot be at the mercy of the interests of the capital. Earlier, Teresa Ribera, minister for ecological transition, said that the rising electricity costs blamed by the company for the closure were a “smokescreen” to hide the lack of sufficient investment in increasing the efficiency of production. She also noted that Alcoa had traditionally benefited from support measures by the government to alleviate the burden of rising energy costs. As protests intensified, minister of industry Reyes Maroto proposed an auction plan for six-month incentives to companies, including Alcoa, which have a high dependence on energy. However, experts doubted the feasibility of the plan as it was clear that electricity costs were not the reason for the closure of the plants. Alcoa, which has also announced the closure of its plant in Portovesme in Sardinia, Italy, is notorious for its violation of workers’ rights. The company had also announced the closure of two plants in Tennessee and Texas in the United States. According to the report, Alcoa also shut down its alumina refinery in Suriname in 2015, inflicting a serious loss to the nation’s economy and putting hundreds of people out of work. This violated an agreement Alcoa had made with Suriname to conduct operations there until 2033.